106 B.C.–43 B.C., greatest Roman orator, famous also as a politician and a philosopher. (Lucius Sergius Catilina) , c.108 B.C.–62 B.C., Roman politician and conspirator. At first a conservative and a partisan of Sulla, he was praetor in 68 B.C. and governor of Africa in 67 B.C. (Publius Clodius Pulcher) , d. 52 B.C., Roman politician. He belonged to the Claudian gens (see Claudius), and his name is also written as Publius Claudius Pulcher. He was brother to Appius Claudius Pulcher and to the notorious Clodia. In 62 B.C. (Cnaeus Pompeius Magnus) , 106 B.C.–48 B.C., Roman general, the rival of Julius Caesar. Sometimes called Pompey the Great, he was the son of Cnaeus Pompeius Strabo (consul in 89 B.C. ), a commander of equivocal reputation. ..... Click the link for more information. the following year and was hailed as a hero. Although he was born into the Julian gens, one of the oldest patrician families in Rome, Caesar was always a member of the democratic or popular party. ..... Click the link for more information. , Cicero was a leader of the party that caused him to convene (56 B.C.) the triumvirate at Lucca. In 51 B.C. he was governor of Cilicia, and on his return he joined Pompey against Caesar. 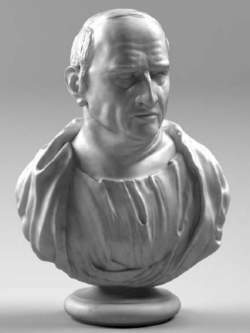 After the civil war Caesar forgave Cicero, and he lived in honor at Rome under the dictatorship. He did not take part in the assassination of Caesar, but he applauded it. Lat. Marcus Antonius, c.83 B.C.–30 B.C., Roman politican and soldier. He was of a distinguished family; his mother was a relative of Julius Caesar. , in ancient Rome, ruling board or commission of three men. Triumvirates were common in the Roman republic. The First Triumvirate was the alliance of Julius Caesar, Pompey, and Marcus Licinius Crassus formed in 60 B.C. , 63 B.C.–A.D. 14, first Roman emperor, a grandson of the sister of Julius Caesar. Named at first Caius Octavius, he became on adoption by the Julian gens (44 B.C.) Caius Julius Caesar Octavianus (Octavian); Augustus was a title of honor granted (27 B.C. ..... Click the link for more information. ), who had been supported by Cicero against Antony, allowed Antony to put Cicero's name among those condemned, and Cicero was put to death on Dec. 7, 43 B.C. To the modern reader probably the most interesting of Cicero's voluminous writings are his letters to Atticus, his best friend; to Quintus, his brother; to Brutus, the conspirator; to Caelius, another close friend; and to miscellaneous persons. They reveal more of Roman life and political manners than does any other source. His philosophical works, which are generally stoical, include De amicitia [on friendship]; De officiis [on duty]; De senectute [on old age], or Cato Major; De finibus [on ends], a dialogue on the good; The Tusculan Disputations; and De natura deorum [on the nature of the gods], an attack on various philosophies, especially Epicureanism. Cicero's rhetorical works are of less general interest. De oratore, addressed to his brother, is a kind of handbook for the young orator; Brutus is an account of Roman oratory; and Orator is a discussion of the ideal orator. The most widely read of Cicero's works are his orations, which have become the standard of Latin. The most famous of these are the Orations against Catiline, on the occasion of the conspiracy, and the Philippics against Antony. Other famous speeches are Against Verres, On the Manilian Law, On Behalf of Archias, On Behalf of Balbus, and On Behalf of Roscius. Cicero's literary and oratorical style is of the greatest purity, and his reputation as the unsurpassed master of Latin prose has never waned. See Loeb ed. of his works (28 vol., 1912–58); his letters (tr. 1969); studies by T. A. Dorey (1965), D. Stockton (1971), D. R. S. Bailey (1972), and A. Everitt (2001). (Alfonso or Alphonse Capone) , 1899–1947, American gangster, b. Naples, Italy. Brought up in New York City, he became connected with organized crime and was the subject of murder investigations. a city in the northern United States, in Illinois. Population, 63,000 (1974). An important industrial suburb of Chicago, Cicero employs approximately 40,000 workers in its various manufacturing industries. In addition to electronics and metal-working industries, the city has plants for the production of industrial equipment and household appliances. Cicero analyzed dreams in his work De divinntione in which he asserted his belief that dreams were not prophetic; they were simply the mind thinking about what was happening in the waking life. The Roman orator and statesman Marcus Tullius Cicero (106–43 B.C.E.) wrote a variety of philosophical works during periods of forced retirement from public life. Most of his philosophical works are dialogues between distinguished Romans and young men just beginning their political careers, preceded by an introduction in defense of philosophical studies. Among his works on logic are Academica (45 B.C.E. ), on the dispute between dogmatists and skeptics adhering to the philosophical doctrines of Plato‘s Academy about the criteria of truth, and Topica (44 B.C.E.). De finibus bonorum et malorum (45 B.C.E. ), Tusculanae disputationes (45 B.C.E. ), and De officiis (44 B.C.E.) are his major ethical writings, whereas De oratore (55 B.C.E.) is among his rhetorical works. De natura deorum, De divinatione, and De fato (45–44 B.C.E.) present Epicurean, Stoic, and Academic arguments and counterarguments about religion and cosmology. Cicero’s De republica (51 B.C.E.) contains the famous Dream of Scipio, in which dreams are utilized as a convenient mode of exposition. This literary dream portrays the state of virtuous souls after death, which is a more pleasant existence in the region above the moon. It also reveals Scipio’s own future, foretells Rome’s victory over Carthage, and finally shows Scipio the movements of the heavens and celestial objects, as well as of the earth in its entirety. Particularly in his essay De divinntione, Cicero composed a sophisticated analysis of dreams, and much of what he said anticipated later criticism of all forms of dream interpretation. He criticized the popular conviction that dreams might be prophetic, maintaining that no divine energy inspires dreams and visions. His analysis asked such questions as, Why do the gods not warn us of impending events when we are awake rather than during sleep? How can one distinguish between true and false dreams? Cicero took little account of cures indicated in dreams; rather, he asserted that human intellect alone has to be considered sufficient to provide for humanity’s own future welfare. He also maintained that because there are no objects in nature with which dreams have a necessary connection, and because it is impossible to achieve a sure interpretation of them, dreams should not receive credence, nor be entitled to our respect. Dreams, according to Cicero, are simply the overflow from our waking life. Although he was highly skeptical about dreams, he was nevertheless very concerned with one of his own dreams, in which he saw Octavius as a man who would rise to supreme power in Rome. In the struggle for power after the death of Julius Caesar, Octavius emerged the victor. Cicero and his brother Quintus, who had provoked the enmity of Mark Antony, were included in the purge lists and were killed on demand of Antony himself. In Europe, a printer's unit of type measurement equal to 12 didot points or 4.51 millimeters (0.178 inch). Control Information system Concepts based on Encapsulated Real-time Objects.